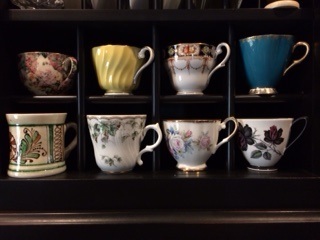 I have a small collection of tea cups. They represent something more to me than just sipping a cup of coffee or tea. It’s what happens while drinking a hot beverage with a family member, good friend or acquaintance that appeals to me. The slower pace, limited distractions and simplistic act of drinking a hot beverage usually foster a relaxed conversation that can range from the superficial to some pretty deep stuff. Until recently, I didn’t realize that I was just as fragile as one of the cups in my collection. I’ve always been an emotional person, and I’ve had some major changes in my life the past few years. At times, I haven’t felt very confident, loveable or stable, but I always thought that I hid my feelings behind a “put together” façade. I learned this wasn’t the case as I was having a cup of coffee with a friend and she commented on how far I’ve come in terms of my personal development. She said in the past she’d censored what she said to me because she didn’t want to upset me. My initial reaction was sadness. I felt bad that my good friend couldn’t be herself around me. My thoughts quickly changed to pride. The point my friend was making (and which I’m very grateful for) was that I’m not that person anymore, that I’m a better version of myself. 2. Writing: I write very day. Usually after I meditate, I write down one or two things that I’m grateful for and I also write my intention for the day. These things aren’t always earth shattering. For example, I’ve been grateful one or two times for a much-needed nap! 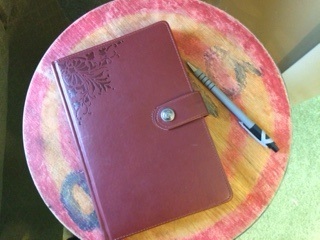 I have a pretty red journal that I like, but anything will do. I’ve accumulated a stack of journals over the years and there are a few marble composition notebooks in the heap. Although I don’t have this one yet, I hear The Desire Map Day Planner, by Danielle LaPorte is pretty cool. I also write here, on my blog. This public format has actually been very helpful in two specific areas, confidence building and authenticity. I am open and honest in my posts and I’ve gotten some positive feedback on both the content and quality of my writing. 3. Yoga: I do my own thing, at home with either a DVD or a YouTube video. I just finished day 11 of the YouTube series, “30 Days of Yoga With Adriene.” I set up a little space in my house where I practice yoga. 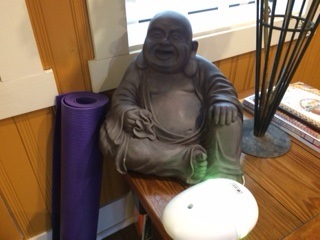 It’s simple, my mat is nearby, along with a Happy Buddha statue and my aromatherapy diffuser. I have a blanket that I roll up for support when I need it but I want to get a yoga block soon. 4. Decluttering and Minimalism: This has been an amazing part of my journey! I first noticed Courtney Carver’s, Be More With Less blog on Facebook and began to read her posts about the benefits of consuming and owning less. Creating a paired down living space (and an emotional space) have obvious benefits. What I didn’t expect were the secondary gains. When I started to reduce and remove things (clothes, household items, relationships, social media) that didn’t provide joy and meaning, I had more room for the things I truly loved. 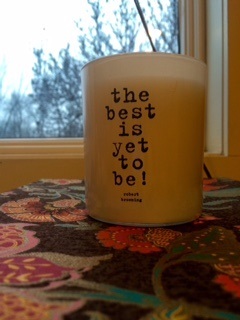 This has become a new mindset for my husband and me, which is addicting! I started with this simple rule: For a new article of clothing or household item to come into my house, I have to get rid of one item. This way, at least I could get a handle on what I already owned and keep that number from growing. and Joshua Becker’s blog on Minimalism http://www.becomingminimalist.com/about-us/. I’m so grateful to those of you who have supported me throughout one of the most challenging periods of my life, for you have truly sustained me and I continue to learn from you. I’ve even developed closer relationships with some of you as I’ve focused on becoming more authentic! Thank you! I’ve shed the unrealistic need for everyone to like me, and so, if I’m not your cup of tea, it’s really OK, make room for someone who is. Thanks T! I learned a lot about how to be a good friend from you! We will get together real soon. Love you!